"Increasing demand for wash suitable potatoes"
There is more and more demand for real specialist work on the potato market. 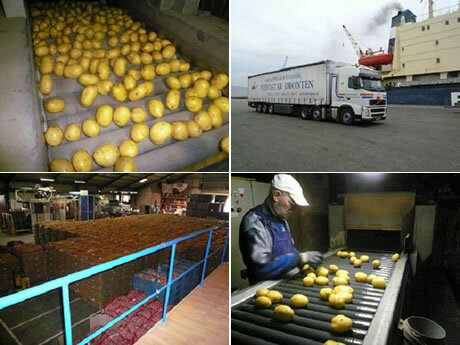 This was testified by Jaap Kodde of potato wholesaler Flevostar Dronten. "The demand is coming both from Europe and outside. We have been supplying wash suitable potatoes to the Middle East for some time. That work takes a lot of time and energy, and you take down your capacity, but you're providing something that is in demand. It's not for everyone." "The demand from Eastern Europe is increasing. The big question is what Russia will do. Discussions between Russia and the EU will take place again shortly. I think that we can play an important role in meeting the phytosanitary needs of such a market with washed potatoes," says Jaap. "The quality is good at the moment. We need to look more and more at other qualities for export and potatoes with a good skin colour have a bonus for suppliers." According to the trader the sales to the domestic market have been mediocre for months, partially because there still hasn't been any real winter weather. "We know that the harvest from Germany is a lot lower. So as far as export is concerned the competition is from Belgium, France and possibly the UK. We already have a bit of competition from France, especially towards Eastern Europe, but I am convinced that if we are on top of quality and listen to the customers we will be able to handle the competition." "I'm not negative about the continued market developments. The cold weather in Southern Europe will mean a slowed down planting of the new harvest. The industry is running at full speed and will continue this way for a while. With events like the Football Word Cup coming up, we know that the demand for processed potato products will rise again this summer. Who knows, we might get a late spring again and need all potatoes," concludes Jaap.